Police have warned motorists ''don't do it'', as they launched a crackdown on drink-driving over the festive season. Extra police patrols will be out on Scotland's roads from Friday as the party season gets under way, targeting drivers who are over the limit. Last year - 12 months after the lower drink-drive limit was introduced - one in 35 drivers stopped during the festive season was over the legal limit. That compared to one in 50 motorists caught drink-driving over the same period of the previous year. The new Scottish Government and Road Safety Scotland campaign aims to drive home the message that ''the best approach is none'', reminding motorists that even if they are only slightly over the limit, in the eyes of the law they are a drunk-driver. 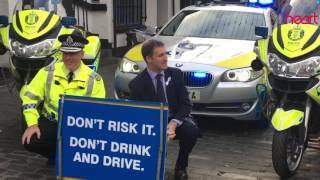 Assistant Chief Constable Bernard Higgins and Justice Secretary Michael Matheson launched the campaign in Glasgow's Ashton Lane, a street full of bars and restaurants. More than 20,000 drivers are stopped by police every month and the force warned drink-drivers that the chances of being caught are higher than ever. Mr Higgins said: ''The message to drivers is don't believe the myths. Don't believe that if you're 5ft 10in and weigh 170lb you can have two pints and you're safe to drive - it's utter nonsense. ''People react differently to alcohol dependent on their metabolism, and it applies the same the morning after. Don't go on to the internet and Google how much you can drink, it's just rubbish. Police said that between December 2015 and January, 452 drivers failed a breath test. Scotland's lower drink-drive limit came into force in December 2014, reducing it from 80mg to 50mg in every 100ml of blood. Mr Matheson said: ''We led the way in the UK by reducing the legal alcohol limit and this is already having an effect on changing attitudes in a way that keeps people safe. More people now know that even one drink before driving is one too many. ''Unfortunately, there is a persistent minority of drivers who continue to ignore the law. These people are not only risking their own lives, but are risking the safety of other road users and pedestrians by drinking and driving.